Excavations at Highland are upending history. Recent research reveals that the building considered Monroe's home may have been a guest cottage, and that Monroe's home was much larger. In April of 2016, archaeology, combined with tree-ring dating, showed that a newly discovered foundation, not the modest home still standing on the property, was the Monroe (1799) house. Over his lifetime Monroe contributed a 50-year career in public service, serving both the Commonwealth of Virginia and the nation in a variety of positions including his two-term presidency from 1817 to 1825. “People always ask me about the importance of archaeology and how it makes a difference in today’s world,” said Mike Barber, state archaeologist with the Virginia Department of Historic Resources. “Highland provides a prime example of the power of the archaeological record to rewrite history. The evidence is often just below ground and following the best practices of stewardship and archaeology returns the best results, as these findings at Highland prove,” Barber added. The discovered foundation shows a free-standing and sizeable house. The findings include part of the base of a large chimney — preserved below the floor level, several sections of stone wall foundations, segments of thicker walls belonging to a stone cellar – now filled with brick rubble and charred planks, likely pointing to the destruction of the building by fire. “Monroe sold the core of his Highland property in early 1826, and it is likely that the house burned sometime in the mid-1800s. We have not yet found contemporary accounts of a fire at Highland, but later newspaper articles refer to the destruction of the former Monroe residence, and the subsequent construction of the new Massey house in its place. The Massey structure was likely completed in the 1870s,” said Dr. Benjamin Ford, principal at Rivanna Archaeological Services, LLC, in Charlottesville, the firm conducting research on the newly discovered house. The discovery of the foundation is part of larger research efforts on the property, including dendrochronology, the dating of historic wood through tree rings. 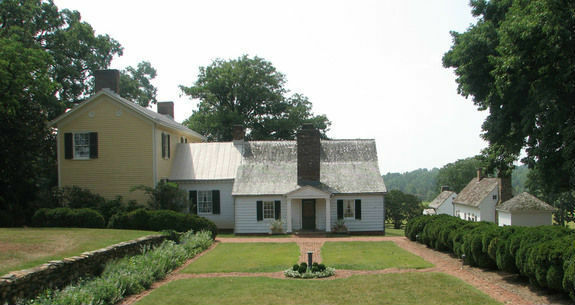 Dendrochronology was conducted on the modest building that has been long considered James Monroe’s house, providing confirmation that the house now standing on the property dates to 1818, and not 1799 as previously thought. “Dendrochronology showed the wood in the corner posts of the standing house was cut between the spring of 1815 and the spring of 1818,” said Dr. Michael Worthington, proprietor of Oxford Tree-Ring Laboratory in Baltimore. This later structure is believed to be a dwelling Monroe mentioned building in a September 6, 1818 letter to his son-in-law. The construction was likely part of a larger renovation and building campaign that Monroe conducted on his Albemarle and Loudoun County properties early in his first term as President, Bon-Harper added. Other artifacts found during the investigations included a significant quantity of bottle glass, ceramics, and fragments of home furnishings. Bon-Harper said the discovery of the foundation sets the stage for continued research, noting additional archeology is planned. Tours of the property reflect the new interpretation of the site. Long-term plans for the property include extensive excavation and eventually virtual reality experiences of the house now being uncovered. Discovery will be the essence of the new visitor experience, Bon-Harper said.